You won’t find me in the stores come Black Friday. 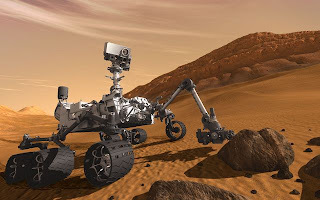 I’ll be riveted to the TV, watching NASA launch its latest mission to Mars. If all goes according to plan, the Mars Science Laboratory will lift off at 10:25 a.m. East Coast time on November 25, and arrive at Mars at roughly 10:00 p.m. West Coast time next August 5. Though as an old space geek I’d probably watch anyway, I’m particularly invested in this mission. Laura Hermann and I traveled to the NASA Langley Research Center in Hampton, Va., recently (twice) to provide media training for a team of engineers responsible for getting MSL safely from the edge of the Martian atmosphere down to the planet's surface. MSL will deliver the largest payload ever to the surface of another planet, the Curiosity rover. It’s about the size of a Mini Cooper, and it will look for signs that Mars once had – or currently has – the conditions necessary to sustain life. The NASA Langley engineers also will collect data on the spacecraft’s descent to the surface and use it to improve on future missions, both manned and unmanned. NASA’s Jet Propulsion Laboratory has a terrific video showing the spacecraft’s entry, descent and landing. It’s amazing what they can do on a planet tens of million miles away.